- We Play for Valerie!" - We Play for Valerie!". The girls from Craponne near Lyon are fulfilling a mission in the Latvian capital. Of course the women from Craponne near Lyon want to win the volleyball tournament at the 5th World Sports Games 2017 in Riga. “It will be very hard now”, said team captain Isabelle Donato after their defeat in the opening match against an equipe from the host country Latvia. But this is not the most important thing for the French team: the girls are fulfilling a mission in the Latvian capital. “Six years ago our team mate Valerie Verriere died of breast cancer will only 31 years of age”, Isabelle explained. 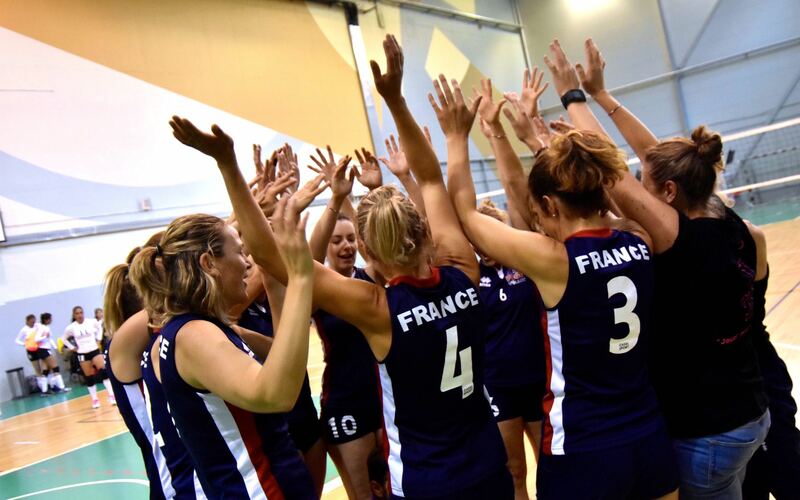 “Jouer pour Elle…” (“Play for her…”) is printed on the team’s jerseys. The team takes Valerie’s jersey with number 11 on every trip as a lucky charm. In Riga the girls from Craponne are part of the large team of FSGT consisting of 215 members, participating in ten different sports disciplines. “Bonne chance” to the brave French team. “Jouer pour Elle…” – you already are one of the great winners at the 2017 Games by conquering our hearts.